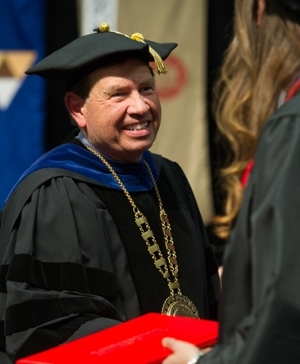 Southern Illinois University Edwardsville celebrated its 2016 Spring Commencement exercises Friday and Saturday as 1,850 students received their diplomas in the Vadalabene Center on campus. After bestowing degrees Friday night upon Graduate School, School of Business and School of Nursing students, Interim Chancellor Stephen Hansen continued Saturday with the Graduate School, and School of Education, Health and Human Behavior in the morning, with the College of Arts and Sciences in the afternoon and finished with the Schools of Engineering and Pharmacy in the evening. 6:30 p.m. - 8:30 a.m. - 12:30 p.m. - 5 p.m.
Mariah Huelsmann, who earned a bachelor’s in anthropology, was the student speaker for the afternoon session and noted, “College is a season of life, a time to grow and change. The college experience is an ephemeral one, but like springtime on campus, it allows you to bloom into yourself. The morning student speaker was Tarsha Moore, who received a master’s in education/college student personnel administration. She reminded her fellow graduates that, “You determine your own success and being humble leaves room for more blessings to come your way. You are fearless, and no matter what life throws your way, you can handle it because you have come way too far to fail now. Thelma Mothershed Wair was awarded an honorary Doctor of Humane Letters during today’s afternoon ceremonies. The SIUE alumna has spent her life championing diversity efforts. In 1957, Mothershed Wair attended Central High School in Little Rock, Ark., as one of the Little Rock Nine. After making her historic footprint, Mothershed Wair earned a bachelor’s in home economics from SIU Carbondale in 1964. She achieved a master’s in guidance and counseling from SIUE in 1970 and completed an administrative certificate in education from the University in 1972. Camille Emig-Hill was honored with the University’s Distinguished Service Award. She achieved a bachelor’s in mass communications and journalism in 1972 and a master’s in business administration in 1977. She began her career in business communications with Ralston Purina. Later, she worked for 30 years at Anheuser-Busch, where she retired as director of human resources shared services. Emig-Hill focused on gratitude and service. “My feeling of gratitude for SIUE is because of the opportunities afforded to me that changed my life,” she said. “My experiences at SIUE were the best of my life and resulted in relationships that were life-changing. 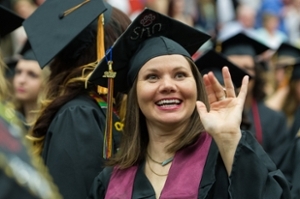 Photo: (Upper Right) SIUE School of Nursing graduate Lauren Castro waves to her family during spring 2016 commencement exercises at the Vadalabene Center. (Middle): Interim chancellor Stephen Hansen congratulates a graduate. 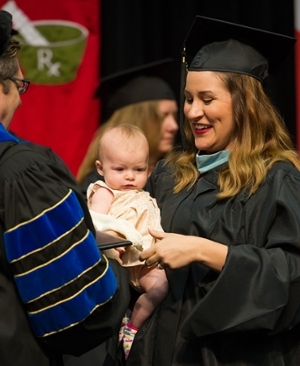 (Lower): Jerry Weinberg, dean of the SIUE Graduate School, congratulates Brooke Tosovsky, holding daughter Gemma.